Off to Explore the Past! 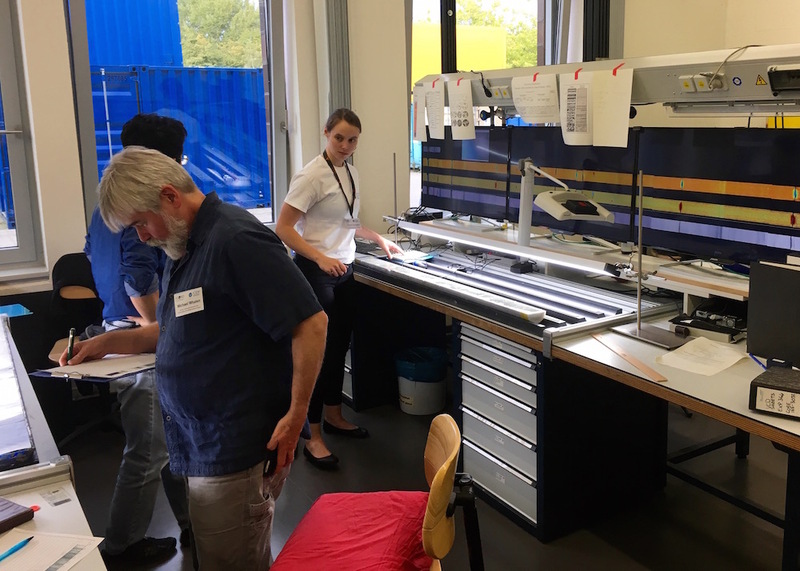 The Chicxulub K-Pg Impact Crater expedition 364 scientists are in Bremen, Germany right now. They are describing the cores they drilled last spring in the Chicxulub Crater. After spending a couple weeks with them I have noticed that though describing cores on land has many things in common with describing cores on the JOIDES Resolution, there are definitely some things that are different. The most obvious difference is that core description on the JOIDES Resolution is happening on a boat, while core description in Germany happens in a building. MARUM is part of the University of Bremen. One of the main reasons we are in this building is because it contains one of the IODP’s core repositories where the cores are stored after expeditions. The Bremen Core Repository is a little reminiscent of the warehouse in that last scene in Raiders of the Lost Ark, but instead of containing mystic objects that are being neglected by bureaucrats, it contains over 154 km of ocean core. The repository is basically a giant refrigerator that creates all the conditions necessary to preserve ocean cores. It is the only IODP core repository in Europe (the other two are in Japan and Texas), so when the IODP mission-specific platform expeditions occur, which are always run by ECORD, the core description always happens in Bremen, because the core repository there can take good care of the cores and the university has all the lab equipment and space the scientists need. The speed at which scientists do core description on the JR depends on how quickly the cores are being drilled and retrieved. Sometimes, the scientists may be waiting awhile for the next core. Occasionally the cores may be coming up faster than the scientists can describe them and then they have to catch-up during transits. In Bremen, the scientists do not have to wait for the cores, because the cores have actually been waiting for them. Since the cores have already been drilled, the co-chief scientists and project managers already know exactly how many cores need to be described and how much time the scientists have to describe them. To stay on track, the Chicxulub Crater scientists need to describe about one core an hour. Just like on the JR, the first step in Bremen core description is to cut the cores in half. The saw used in Bremen is a little different from the one used on the JR, because it continuously sprays the cores and saw blade with water during cutting, so nothing gets too hot. Once the cores are cut and cleaned, the breakdown of core description is pretty much the same as it is on the JR. There are scientists doing visual core description, physical properties analysis, paleontology, geochemistry, paleomagnetism analysis and microbiology on the cores and or smaller samples from the cores. Of course one major difference during core description in Bremen is you can look out the window and see trees. Some of the instruments used to analyze the core in Bremen are different from the ones used on the JR, though they accomplish the same purpose. For example, this is what they use in Bremen to take high resolution images of the cores, which is not the same kind of instrument used on the JR.
And since MARUM rarely gets tossed around by ocean waves, none of the instruments need to have a gyroscope built into them to keep them stable like some of the instruments on the JR. So core description has some differences but is mainly the same in MARUM and on the JR. But how about the day-to-day life for the scientists? The life on land and the life at sea have a lot more in common than I initially would have guessed. I will write about that in the next post.